Our Hypoallergenic Luxury 312 Mattress by Healthbeds features a more traditional and robust open coil spring unit which provides a firm and stable sleeping surface. With a cover featuring cool technology, this mattress is great for those summer months. The Hypoallergenic Luxury 312 Mattress by Healthbeds utilises a more traditional and firm open coil spring unit which provides your body with a supportive and stable sleeping surface. Hypoallergenic fillings ensure that this mattress offers a high level of comfort and is beneficial for those who suffer from an allergy. A micro quilted cover utilises cooling technology to keep you cooler and fresher at night. 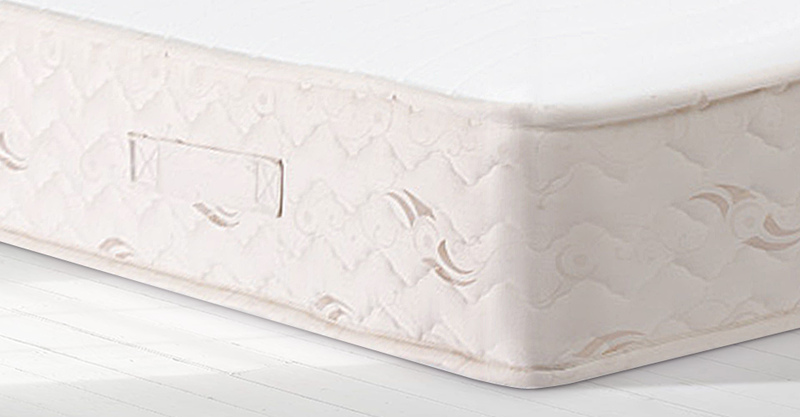 The micro quilted border helps to give this mattress an overall attractive finish. Air vents are strategically placed along the mattress border to promote healthy air flow which helps to keep the mattress fresh and hygienic. Flag stitched handles ensure that this mattress can be conveniently rotated with ease. The Hypoallergenic Luxury 312 Mattress by Healthbeds if of a medium firmness rating. This would make an ideal choice of mattress for those who prefer the support and comfort that a standard medium mattress has to offer. This is one of our entry level mattresses by Healthbeds yet features great levels of support and comfort. With hypoallergenic fillings, this mattress would be a welcome addition to anyone who suffers from an allergy – or even those that don’t. Please quote this Products's code 25006 to speed up your query if related. by Healthbeds features a more traditional and robust open coil spring unit which provides a firm and stable sleeping surface. With a cover featuring cool technology, this mattress is great for those summer months.